Lightweight – 370g or approximately 13 oz. Produces images with high picture detail. Dimensions: 56(W) x 50(H) x 128(D); Weight: Approx. 370g. 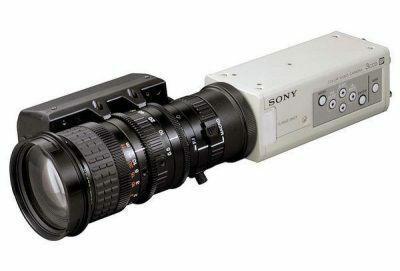 Offers choice of many available lenses and allows for synchronization of eye piece focus to camera image. Allows for verification of color on monitor, useful in microscopy. Allows for synchronization of signals with Frame Grabber Boards. Unique feature function for managing contrast of each pixel according to a histogram of video signal level distribution. Innovative DSP technology virtually eliminates hue factor distortion and suitable for knee correction. Emphasizes contrast in dark area while black compression enhances or deepens darkness. Allows a particular color to be selected and its hue, saturation and detail to be altered. Allows for easy control and operation of camera by external computer. Enables the user to set two custom parameters in the menu for instant recall.